London, 17 September 2008 – NEC Display Solutions is proud to present its new “must have” NEC MultiSync® 24WMGX3 LCD display which is a part of its highly successful NEC MultiSync® GX series. Now in its third generation, the widescreen LCD not only offers a 24” wide display, but also an array of features to make it the ideal “all-rounder” display solution for all office and multimedia applications. The display has been equipped with an A-MVA panel offering a dynamic contrast ratio of 2000:1, brilliant colour reproduction and high viewing angles. The non-glossy surface guarantees the best possible image reproduction, even in bright ambient light. In addition, the NEC MultiSync® 24WMGX3 offers extensive HD connectivity such as VGA, DVI-D with HDCP, two HMDI interfaces, as well as S-video, component and composite video connectors. The NEC MultiSync® 24WMGX3’s elegant design, makes it the automatic choice for any prestigious environment, augmenting the overall ambience in any quality location. The narrow bezel, in black piano lacquer, has integrated speakers, OSD function buttons and headphone socket. In contrast to the crisp, straight lines of the bezel, the stand has a sweeping curve. With its exclusive design and attractive form, it is ideal as a prestige product in reception environments where first impressions matter. Whether in hotel lobbies, for meetings in the CEO’s office or for use in exclusive-ambience home entertainment, the NEC MultiSync® 24WMGX3 is always an impressive eye-catcher. The non-reflective panel surface allows the best possible viewing even when used in the brightest of environments. Outstanding features complement the NEC MultiSync® 24WMGX3’s distinctive design. The high-quality AMVA panel ensures the highest standards in image reproduction, including a resolution of 1920 x 1200 at 60 Hz, a contrast ratio of 1000:1 (dynamic contrast ratio is 2000:1) and a brightness of 500 cd/m2. Exceptional viewing angles of up to 178 degrees allow viewing from almost every position. The multiple connector options of the NEC MultiSync® 24WMGX3 open up a multiplicity of application possibilities. Alongside an analogue interface, two HDMI ports as well as the DVI-D interface with HDCP enable the fully digital transmission of audio and video data, for example from a PC, a games console, or a DVD recorder with HDMI. Once a TV-tuner or a video camera has been connected to either the S-video, component or composite video ports, this monitor can also be used as an effective stand-alone TV. The NEC MultiSync® 24WMGX3 has also been equipped with sRGB support for intense, crystal-clear colours, and with its 6 ms response time it is therefore also particularly suited to the reproduction of video and imaging material, as well as for high-end gaming applications. Due to its generous wide-screen format, it also offers picture-in-picture display mode – a practical feature, for example, with video-conferencing. Such a display mode is also ideal for allowing the user to be able to keep up-to-date with sports or TV events in parallel to work. The NEC MultiSync® 24WMGX3 brings alive the experience of multimedia applications with its 5+5 Watt loudspeakers. These are integrated into the monitor bezel and enhance visual content with superlative sound. The excellent surround-sound quality creates impressive audio depth and ensures an exhilarating acoustic experience. Naturally, if required, the loudspeakers can be switched off at any time or the conveniently situated front mounting headphone socket can be used. An infra-red remote control is supplied with the 24” LCD display offering versatile operation and allowing the user control over all important functions and settings from anywhere within the vicinity. So as to allow it to be perfectly fitted to the particular conditions of any application environment, the NEC MultiSync® 24WMGX3 can be height-adjusted by up to 60 mm. Adaptation of the backlight according to the ambient brightness is also taken care of by the AmbiBright function. With the help of an integrated light sensor, the AmbiBright function allows optimisation of the device’s ergonomic and power-saving settings as the local lighting conditions vary. The intelligent visual (IV) mode also regulates the brightness of the display according to ergonomic criteria, including aspects such as the brightness content of the currently displayed image to create a comfortable, easy-on-the-eye visual experience. 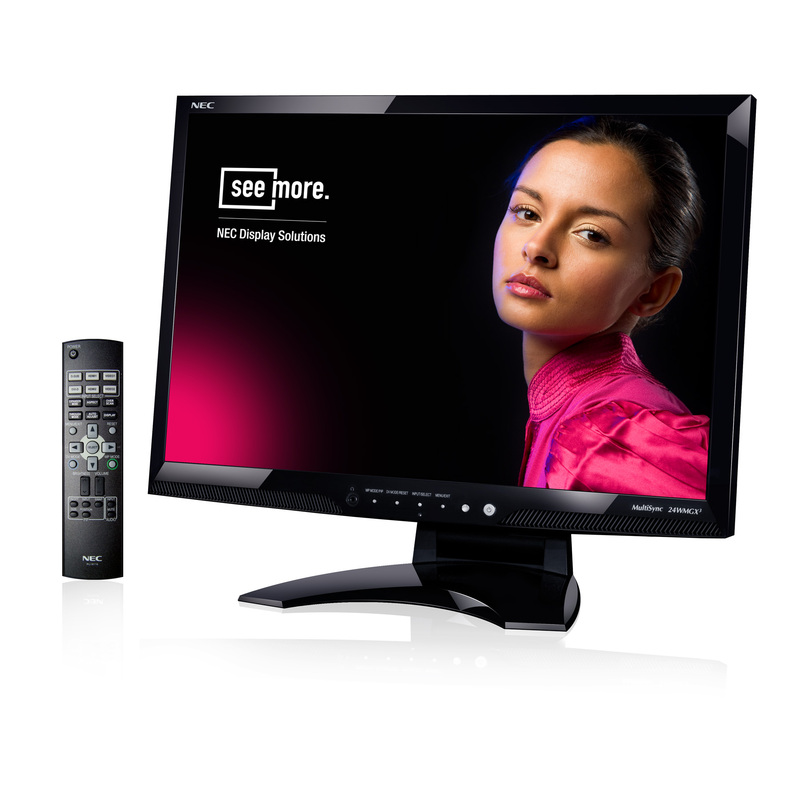 The NEC MultiSync® 24WMGX3 is now commercially available in black, for a SRP of £565.00(ex. VAT). Included in the package are a power cable, an analogue signal cable, as well as VGA, DVI-D and HDMI cables, a handbook, an installation and drivers CD and also a remote control. NEC Display Solutions Europe offers a three year warranty on its devices including the backlight. NEC Display Solutions Europe GmbH has its European headquarters in Munich, Germany and is responsible for all business activities in EMEA, divided into the four sales regions Northern Europe, Western and Southern Europe, Central Europe, Eastern and South-East Europe with Middle East/Africa. NEC Display Solutions benefits from the technological know-how and technologies of the NEC Corporation and, with its own Research and Development, is one of the world's leading manufacturers offering the widest product range of display solutions in the market. The display product portfolio ranges from entry-level to professional and speciality desktop LCDs, via large-size Public Displays for Digital and Retail Signage (LCD and plasma technology) to plasma displays for home cinema applications. The Projector range offers products for all needs, from portable devices via business projectors to products for permanent operation (such as PoS applications) and digital cinema projectors. Managing Director of the European head office is Bernd Eberhardt. NEC Corporation is one of the world's leading providers of internet, broadband network and enterprise business solutions dedicated to meeting the specialized needs of its diverse and global base of customers. NEC delivers tailored solutions in the key fields of computer, networking and electron devices, by integrating its technical strengths in IT and Networking, and by providing advanced semiconductor solutions through the NEC Electronics Corporation. The NEC Group employs more than 150,000 people worldwide. This press release was distributed by ResponseSource Press Release Wire on behalf of MUSTARD PR in the following categories: Consumer Technology, for more information visit https://pressreleasewire.responsesource.com/about.